US, 1961, 99 minutes, Black and white. Howard Keel, Tina Louise, Warner Anderson, Earl Holliman, Burt Reynolds. 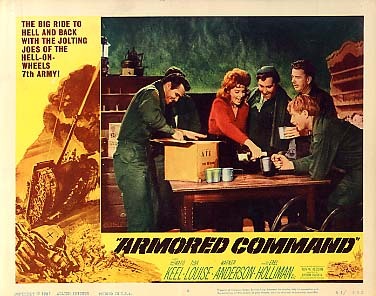 Armored Command is a conventional war film. It is reminiscent of those made during the war as well as immediately afterwards. However, in the early 1960s these were the last of the conventional war films – before the move to the big-budget wide screen films like Battle of the Bulge. The setting is the Vosges mountains in France, the difficulty of telling whether the attack was a blind or an actual attack. Howard Keel is the strong cigar-chomping commander. Tina Louise appears as a glamorous spy – not always convincing. Earl Holliman is the soldier who falls for her. Burt Reynolds, in an early role, is the scrounger who exploits her. There are some strong combat sequences. However, this is the familiar material. The film was directed by Byron Haskin who began as a cinematographer in the 20s and 30s, moved to special effects in the 40s and 50s and began directing in the late 40s with such films as I Walk Alone as well as the 1953 classic The War of the Worlds. 1.The popularity of World War Two films? The immediate aftermath of the war? The beginning of the 1960s? The perspective on the war? America and the cold war and the interpretation of the war in Europe? 2.Black and white photography, locations, the atmosphere of Europe, the winter, the Vosges mountains? The combat sequences? The picturing of battle? Editing and pace? Musical score? 3.The focus on the American unit? The men, in combat, occupying the town? The interactions of the men amongst themselves? Mike and his leadership? Their finding the young woman, taking her in? Not checking her credentials? Mike and his infatuation? The conflicts with Skee, his going up to the woman’s room with the bottle of drink, the fight between Mike and Skee? Skee being the scrounger? Bart Macklin and his being in charge, his support of his troops? The clashes with Colonel Devlin? Their having to go out on so many raids? To get prisoners? Their being betrayed by the woman? The portrait of the men – and the final fight? 4.Colonel Devlin, cigar-chomping, tough, breaking the rules in the book, but his intuitions and insight? Dealings with Macklin? Dealings with the other leaders? With the men? Hard on them, sending them out? The drinks for Christmas? The mystery of the cognac? The realisation that the woman was a spy? His final vindication? The number of men dead? 5.The other military chiefs, communications, leadership? Communication with Devlin? 6.The woman, the dramatic opening of the film, the silence, her walking out into the snow, her being shot? Lying there? Found by the Americans? Decoy? The woman playing her role, the men and their attraction, Mike, her seductive manner with him? The encounter with Skee? Her listening to the information, going into the town, her espionage connections? The discovery of the truth – feeding her the wrong information? Her final confrontation of Skee, shooting him, Mike and his killing her? 7.The mood of the war, the Germans occupying French territory, the Resistance, the welcoming of the Americans? The confrontation between Germans and Americans? The ultimate result of World War Two?